A group of Korean educators in New York City experienced the thrill of a Challenger Learning Center® e-Mission™ planned and coordinated here in Wheeling as they attended an online workshop at New York's St. John's University on Feb. 5-6. The Korean teachers were linked to the university and took part in two distance learning scenarios offered through the Challenger Learning Center, located in the Center for Educational Technologies®. 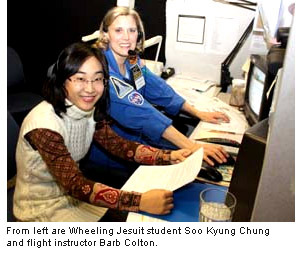 The New York-based teachers were assisted by Wheeling Jesuit University student Soo Kyung Chung, who served as interpreter for the mission. Chung is from South Korea and has been studying at the English Language Institute, located at Wheeling Jesuit, for the past six months. Her responsibility was to assist the flight director flying the mission with any bilingual communication difficulties. There also was a translator in New York helping out. The two lesson scenarios were coordinated by Challenger Learning Center Director Jackie Shia, who traveled to New York for the missions, and e-Mission flight instructors Barb Colton, Cecelia Maltese, and Laura Ondeck, who remained in Wheeling. In the morning e-Mission, Moon, Mars, and Beyond, the teachers helped NASA locate and rescue astronauts. The class was organized into five planet teams to locate and rescue a lost spaceship orbiting one of the outer planets. In the afternoon session the teachers switched to Earth for their technological work in Operation Montserrat. The Korean teachers had to decide how to save the residents of the small Caribbean island of Montserrat as a volcano erupts and a hurricane approaches in this simulated emergency. "This is a great example of how Wheeling Jesuit University plays a part in the global effort of science to transcend geographic boundaries and languages," Shia said. Challenger Learning Center e-Missions are open to anyone with videoconferencing capability and computers. They provide a unique window to the world as they enhance teamwork and critical thinking for all ages and diverse groups. The Challenger Learning Center is one of 47 centers worldwide established by the Challenger Center for Space Science in memory of the space shuttle Challenger. More than 40,000 students fly missions each year either at the Wheeling facility or through distance learning. The Challenger Learning Center has been honored nine years for having served the most children of all the centers.